Kicheche Mara Camp is located on the Aitong Plains in the northern Koiyaki Lemek region of the legendary Masai Mara in Kenya a prime wildlife area. 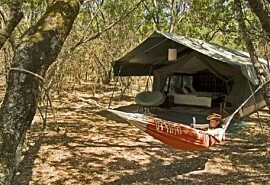 The camp is a traditional tented camp tucked away underneath an orchard of wild olive trees offering magnificent views. Kicheche Mara Camp is located on the Aitong Plains in the northern Koiyaki Lemek region of the legendary Masai Mara in Kenya a prime wildlife area. The camp is a traditional tented camp tucked away underneath an orchard of wild olive trees offering magnificent wildlife viewing in a remote corner of the northern Mara plains. The camp caters for a total of twenty two guests. The Masai Mara is Africa's most famous reserve and offers a once in a lifetime safari experience which Kenya is known for. Gazelle, wildebeest and zebra which graze in large numbers are preyed on by cheetah and leopard. It is however, the black-maned Mara lion who is the star of the show. Elephant, buffalo, kongoni, topi, waterbuck and primates are also found on the wide green gold savannahs of the Masai Mara. The Mara is home to the northern end of the wildebeest migration; wildebeest, zebra and antelope sweep in from Tanzania's Serengeti. Large predators pick off their weak and young as they journey across the Mara. Long after the massive herds of wildebeest and zebra have passed, the plains are still home to an abundant of wildlife. 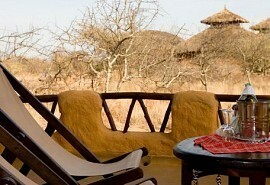 Sarova Mara is a very large safari hotel most suited to families. 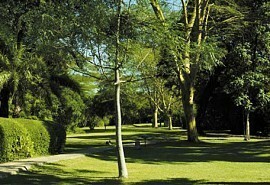 It is located in the southern section of the reserve. The extensive facilities and the fact that it has a fence around it makes it ideal for families. Governors' Camp is situated on the east bank of the Mara river in the preferred safari location of the original colonial governors of Kenya. 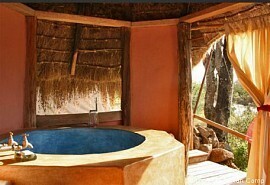 It is ideally located for the wildebeest migration between July and October. 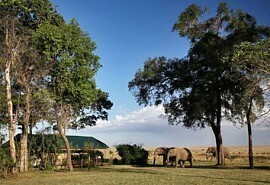 Elephant Pepper Camp is a small luxurious safari camp located in a private concession in the northern Masai Mara. Between July and October, wildebeest and zebra cross the plains, migrating from the Serengeti. Meaning peaceful, calm or serene' in the Masai language, Serian Camp is set in the tranquil shade of large Oleadendra and Walburgia trees in the secluded valley flanking the Mara River close to the Siria Escarpment. 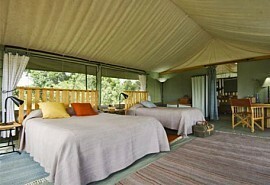 Richard's Camp is situated in a conservation area north west of the Masai Mara in Kenya. This area is known for the most exceptional big game viewing. 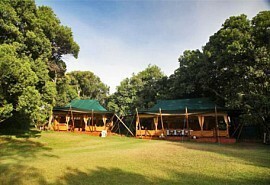 It is a small and exclusive camp within a very personal environment. 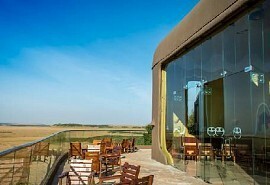 Mara Serena Safari Lodge is a large 74 roomed lodge situated in the Mara Triangle. It is well located for the migration, but mostly used by groups and package tours. Situated on a hill, the lodge overlooks 1 800 sq km of rolling plain, woodlands and rivers.